0 Comment June 21, 2017 Like? In this video, we review the latest h.265 compatible with PTZOptics cameras and the popular VLC Media Player. The VLC Media Player has support for h.265 encoding which is roughly 20-30% more efficient than H.264. Using H.265 RTSP streaming can be a great way to stream video from PTZOptics cameras without requiring the large bandwidth pipelines that MJPEG streaming include. 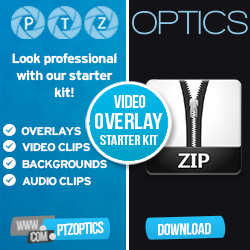 PTZOptics cameras do support MJPEG streaming which is completely un-compressed video with very low latency but we suggest using a dedicated network for this to work properly. Now for the fun stuff. Since we can stream in H.265 to the VLC Media Player we can also use the NewTek NDI Tool Kit for making that video NDI ready. We can then use this to integrate H.265 video into other video production software such as: Wirecast, vMix, Livestream, TriCaster and Isorecorder. For our example, we use the free NewTek IsoRecorder and we use the vMix multicorder which only supports Camera sources and NDI sources. So as you can see once we connect our H.265 RTSP stream with video and audio to the VLC media player we can install the NewTek NDI Tool Kit. This tool kit will automatically update the VLC player to output NDI video and audio sources on our network. This will open up new doors for our video production workflow including support for vMix, Wirecast, Livestream and Tricaster. We can also use a host of video production tools that are free (some are premium) from NewTek. One of our favorite tools is the NewTek NDI Isocorder which will allow us to record multiple cameras in resolutions up to 4K independently. The pictures above outline the process of setting up the VLC Media Player to work with our H.265 live RTSP stream and the NewTek NDI. Once you have the NewTek NDI tool kit installed you can simply go to preferences and setup your default audio and video sources to output via NDI. This will allow us to output low latency high quality video over our network which will automatically be detected via vMix, Wirecast, Tricasters ect…. Today we are going to tackle a very important topic so many of our customers have been asking about and I think can really benefit from this and that is RTSP streaming. And we support multiple ways of RTSP streaming so let’s look at the different ways and we’re going to look at streaming to VLC which is a very special plug-in that supports h.265 now, which is the most advanced compression algorithm available today which PTZ optic supports and we can actually use the new tech ND i plug-in with VLC in order to connect VLC and our video source to multiple different video production solutions like vMix and Wirecast and all these other ones. So PTZOptics supports h.265, it’s the same quality roughly as h.264 but you’re going to see 20 to 30 percent less bandwidth used in your network which can be crucial for so many real-world applications. So let’s talk about MJPEG which is completely uncompressed video (Actually there is some compression via JPEG but it is minimal), it sends every single frame over the network with no compression whatsoever. This is ideal for dedicated networks where you have no other bandwidth to worry about, you’ve got no congestion, maybe no one else is on your video network. Now on our network here at our office, MJPEG can sometimes stutter a little bit because there’s so much streaming going on, 50 different computers, hundreds of devices if you include all of the smart phones and different devices trying to access bandwidth on your network. So using h.264 and now h.265, we can reliably use our existing networks and have still really great 1080p video off our cameras in 60 frames a second. I’m going to show you just how good h. 265 looks in this video but the main reason is the bandwidth, you know a lot of people don’t have dedicated networks that can support uncompressed video, now in this tutorial and I’m taking your questions. I’m looking in the chat right in front of me. I have my chat room here but we’re going to look at streaming to the NDI plugin and then using NDI to connect to vMix, Wirecast, livestream, the NewTek TriCaster and some of the really great new tech NDI tools such as the ISO recorder which effectively allows us to isolate, do isolated recordings of multiple NDI sources, could be potentially our RTSP streams, so that’s exciting. So first of all, let’s look at the setup and what I’m going to do is, I’m going to actually pull up a live set up right here, come on here we go. So on this side over here you’re seeing, this is the camera feed and I’m going to take this full screen for a second so you can see the quality, this is H.265 streamed directly from a camera in our office. It looks like sharing our secretaries having a private conversation in there so we won’t listen in, hopefully I’m not going to do anything too crazy but you can see the video quality is very rich. We’re not seeing any real compression or degradation and I personally believe that the common man cannot tell the difference between h.265 and uncompressed video yet it’s so much easier to handle on our network. So for example you can see here, we’ve got pan tilt zoom of our camera and we’ve got a whole bunch of options for our RTSP streaming. So first of all let’s go through a couple of these and I meant any questions, just let me know. I’m here to answer, but you can see here that first of all, I have 60 Hertz as my priority, there’s something called dial priority which is set by default. This is the dial on the back of the camera which I’ll show you right here like this, you can see right here there’s a dial on the back of the camera, normally this dial is used to set the frame rate and resolution of your camera and you can see on the bottom of the camera, let me flip it up this way, that we have all of these dial numbers and they all correlate to…like 0 is 1080p 60 and then 1 is 1080p 50 and so forth and so forth. So that’s what the dial is and I’ve turned dial priority off so I can take…I’ll just say 60 Hertz is my priority and I’m using the main profile, you can see that main profile is actually grayed out because the RTSP streaming right now as you can see here to VLC, is locked into VLC so we can’t edit that portion of it but you can actually choose a high base level as well which is even higher quality. Now the next thing here as you can see, we can do MJPEG h.264 and h.265 now, as I mentioned MJPEG completely uncompressed but you’re going to want to have a dedicated gigabit network in order to handle that. It is the best quality RTSP possible, my engineers say it’s just as good as SDI, just as good as HDMI and the latency now is actually very low because there is no encoding that needs to be done so if you’re looking for the lowest latency, highest quality streaming off the cameras, you will choose MJPEG but as I mentioned multiple times, that may not be realistic for your network. H.265 might be the most realistic, now as you can see here, we have multiple resolutions we can choose from, the lower your resolution the less bandwidth that you’ll take and there’s h.264 and h.265 calculators you can use to learn a little bit more about what you’re going to be doing there. We have our frame rate set to 30 frames per second and we have our eye key frame at 30 but we could actually increase that as well but as you can see here, go back to our main profile, the video quality is very rich, there’s no pixilation, the frame rate is very good, I mean we’re not shooting a sports game here but we can definitely see exactly what’s going on here. We’ve got a very good quality now, only last thing here I wanted to mention is that there is variable bitrate (VBR) and constant bitrate (CBR) and then there’s a fluctuation level (FL). The fluctuation level is really only used for variable bitrate, if we’re doing constant bitrate, that means we do not want it to vary at all throughout my…our network so again best for dedicated networks but also best if you want to lock the video in with audio. So we can stream audio and video together over this RTSP stream and if you are doing that you really don’t have to worry about constant bitrate or variable bitrate but a lot of people want to…so many of our customers today and I’ll just kind of go full screen to explain this, so many of our customers are actually asking to go all IP and they want to do it at any cost. They don’t want to run SDI cables, they don’t want to buy…they don’t want to buy capture cards and you know Tom Sinclair called this the poor man switch. And by doing low latency, MJPEG RTSP streaming and then doing a constant bitrate so that there’s no variation but latency, you can sync up the audio with the video if you’re handling audio from a separate source and it’s fairly reliable as long as you’re using a constant bitrate so that’s what that’s used for. So once all of that is done, all we have to do is go to system and we want to hit reboot now, I’m not going to do that because I’m already in the midst of a RTMP stream and I’ve already handled that, you can see a little bit of motion there, some shadows I guess. Some people are walking in and just take a look at that, that is very good when there’s motion, it’s handled very well and the quality in my opinion is quite good and the latency is very low so with that being said now let’s get back to our presentation and I want to talk about some of the implications and then we’ll talk about the VLC plugin and I do have my eyes on the chat here so let me know if you have any questions. I am here to answer them okay. So we’ve gone ahead and logged into the PTZ optics camera we’ve set it up for h.265 streaming and we’ve rebooted the camera so now what we want to do is, we want to go into VLC and we want to go ahead and hit play back. Actually what I’ll do is I think I can zoom into this just here, loop and in media we want to hit open network stream and what we want to do is, do our TSP// the IP address/1 and that right there is how you connect to the camera. That’s the RTSP stream that we set up with h.265 that’s been done because I can see my video here and I’ve got my RTSP stream right there so we’ll look at that in a little bit. So once we’ve done that, we’ve pulled our video into and by the way I just found out that VLC is really one of the only applications that supports h.265, vMix doesn’t support h.265, Wirecast doesn’t support it, I don’t believe the TriCaster support it but because it’s supported in VLC we can now use the NDI plug-in to bring it into all of these hundreds of different applications that support the new tech NDI and that’s what makes this kind of game changing. So we’ve pulled in our media now it’s time to add the new tech NDI, so the first thing you want to do if you haven’t already is download the NDI tool pack for Windows. It’s not available for Mac, this is…it is available for Mac but it doesn’t include the VLC plug-in which is what we need so we’re going to go ahead and download that and once it’s installed you’re going to see in preferences and I would like to actually do this live here. Let’s go ahead and show this live up close and personal here, right here under tools preferences, this is going to pull up a little box like this and there’s two different options, one for audio and our output module we will choose the New Tek NDI audio output and then for video we will also choose be New Tek NDI and that’s really all that’s needed in order to connect VLC to the New Tek NDI and I’m so surprised how easy it is to really set up. It’s so simple as soon as you install the tools that will show up in VLC. So we talked about that and showed you that live, very simple and now we can do so many different things as I mentioned before and this actually entire idea stemmed from a customer wanting to set up a ISO recording of RTSP streams and I wanted to use vMix actually. I can say I’m reading the chats right up here and we wanted to set up an ISO recorder and originally we were using vMix and vMix will only support cameras and NDI sources for the multi corder so the workaround that we found is that if we turn our RTSP streams into…if we turn them into NDI available sources on the network, then we can go ahead and pull them in as inputs and use a multi corder on our RTSP streams so that brings me to my next point here which is, New Tek also offers quite a few different tools for using the new tech NDI and some of them are free, for example New Tek offers an ISO corder. There’s a free and a pro version, so the free version is actually going to work for our customer, he has two cameras, he wants to ISO record them so he wants a clean recording of both and he could actually use vMix to do this, vMix 4k or higher or he can use the free New Tek ISO recorder. There is also a pro ISO recorder for up to 16 channels of ISO recording, so there’s a whole lot that can be done, there also as you can see here if we’re using the New Tek NDI, we can very easily pull in the video via…and there we go, so I’m going to go ahead and close VLC for a second and then reopen it so it shows up as a source. I believe you do have to go ahead and reset it as soon as you add all of the preferences for NDI. So as you can see here in vMix, you can see that little VLC button there that’s showing that the camera is being pulled in via NDI and is automatically detected via NDI via vMix and that would be the same for Wirecast, it would be the same for live stream and all of the other NDI compatible systems that are out there. So also again, this was to solve a customer’s issue but this is a workaround for vMix, if you are trying to use the multi corder with RTSP streams, you can now use the vMix multi corder through the VLC plugin which was my goal of all of this but it also opened up so many possibilities for using the New Tek NDI with h.265, h.264 and of course MJPEG which is the lowest latency and highest quality streaming that you can do and that is it. So thank you so much for watching I’m going to go ahead and jump in. Thank you Eugene, I appreciate the kudos. I’m going to run the credits and we’re going to save this video for YouTube and then I will be back and answering all of your questions live. Thanks for tuning in everybody, I’ll see you in just a moment. The Streaming Idiots Facebook page is a great place to share new ideas and talk about different subjects. The NewTek NDI is often reviewed here and I wanted to share in interesting back and forth Q&A I had with Guillaume de Lafontaine. Guillaume de Lafontaine I don’t see the interest of using H.265 on a LAN where one has 1 Gbits of bandwidth. H.264 and H.265 were created to stream video over the internet where bandwidth is limited and expensive. Besides H.265 is CPU intensive and produces obviously a degraded and compressed image. I also don’t understand why you would use NDI as a final stage for RTSP/H.265/H.264. The main interest of NDI is to produce a very high and visually lossless image quality by slight compression with higher bandwidth usage. When using NDI for a H.265 stream, you lose all the benefits of both protocols. NDI is the best option for LAN > broadcast quality and no latency for production H.265 is to be used for delivery over the internet only. The main reason is that most of our customers do not have the bandwidth to use our un-compressed MJPEG streaming. There are other reasons. For example, vMix will not see a RTSP feed for use in the Multi-Corder. But it will work as NDI source which is an interesting workaround. Also, H.265 does not currently work with vMix or most applications for that matter. Therefore anyone that wants to take advantage of h.265 would need to use VLC to take advantage of it with the Newtek NDI plugin to connect to their video productions. I extensively use NDI in my productions so I’m not to be convinced about its interest and efficiency, but I try to keep the quality as high as possible and I’m always hurt in my body when I realize that some use H264/265 for PRODUCTION when it is designed for delivery. No offense, just another point of view over the work. We also hesitate to touch our clients network. So in a perfect world everything you are saying is true. But, when you don’t want to become your clients IT manager h.264 and h.265 can save the day. Also, you and I can tell the difference but the common man usually cannot tell the difference between un-compressed and compressed video. O yeah, one other thing I forgot to mention. Some of the new machines are built with more than a single NIC card. These will allow you to easily setup a dedicated NDI network or video streaming network that doesn’t interfere with the existing network. But that being said 90% of video production still do not have a dedicated network.